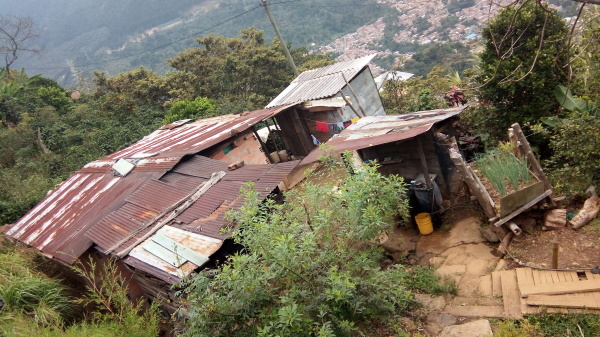 Welcome to La Sierra barrio walking tour in Colombia's city of Medellin. 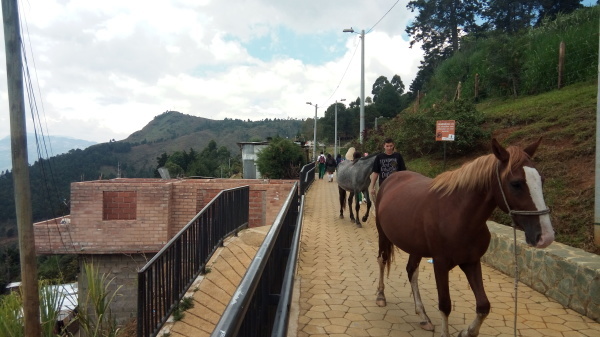 The tour provides guests and foreign travelers with a unique cultural experience far from the traditional tourist destinations, taking adventurous travelers on a fascinating journey high above the hillside barrios, completely off the beaten path up to the lush green mountains in Medellin. 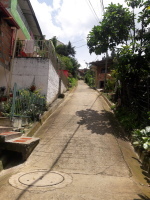 If you are wondering what to do in Medellin after exploring the popular tourist attractions, join us on the walking tour to La Sierra community. Take the metro to the San Antonio station, located at the center of the city. The "metro culture" in the city of Medellin contributes to maintaining one of the cleanest metro systems in the world. At the center of Medellin, the guide meets guests at the main entrance for the Tranvia street car, located on the street level, right underneath San Antonio metro station, easily accessible from metro Line A or B. 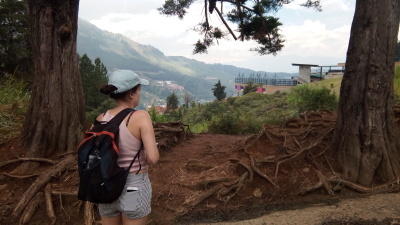 The ride on the Linea H metrocable cars takes guests up to La Sierra barrio. The panoramic views of the city center from high above are simply spectacular as the cable cars approach the top of the station. 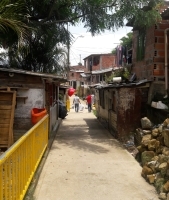 The walking tour in Medellin's La Sierra barrio provides travelers with a unique and honest understanding of the violent and troubled history of Communa 8. 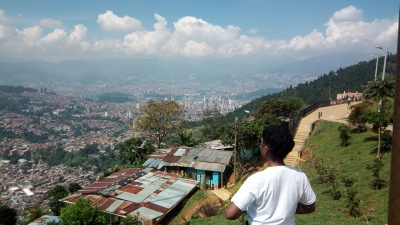 It demonstrates the social problems many of the cities poorest barrios have been plagued with over the past twenty-five years, at the same time being very informative about the cultural, social and economic transformation that Medellin has undergone with the help of many private and public investments, particularlly in public transportation throughout the city, which has help many of the working-class residents in these often neglected hillside barrios to connect to the business district and city center. "My friend and I took this tour with Milena and it was the best decision we made! 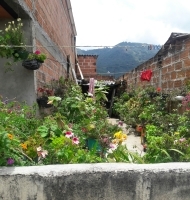 Milena was authentic and honest and opened our eyes to what it means to be a tourist. She told us all about the history of Colombia and the impact of negative portrayals in the media. 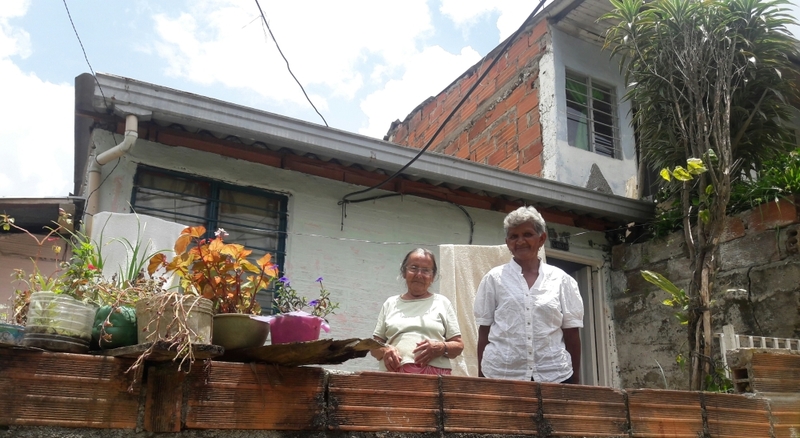 She introduced us to such warm and friendly people in the neighborhood who were proud to be from La Sierra. A very unique experience- something we will never forget!" The walking tour is available every day. The meeting point: The Tranvia entrance, located on the street level when you arrive at San Antiono metro station, walk downstairs to the ticket booth. We recommend sunscreen and comfortable shoes. The tour is not suitable for anyone with reduced mobilty. We support Comunitario San Jose Foundation, a soup kitchen in La Sierra community which helps feed local school children. 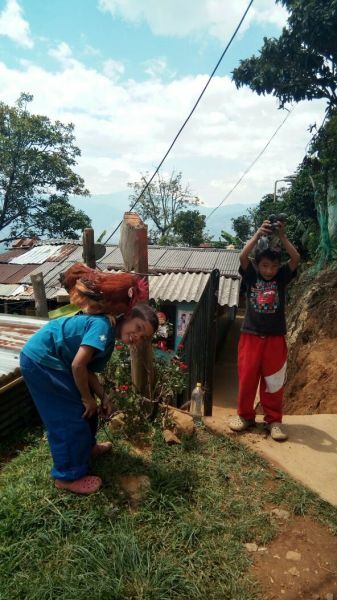 Every guest on the tour allows us to provide one hot meal for a young child for two weeks. 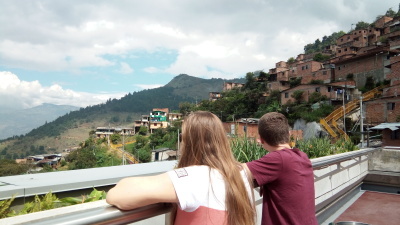 My favorite tour so far in Medellin!